When my sons were small, I didn’t just ‘turn them loose’ as so many of the mothers did. At first we didn’t have a fence, so I would sit on the back porch steps with a cup of coffee, and keep an eye on them while they were playing. I insisted that they have nap time as that was when I could get most of my work done! When we did get the fence up, I still sat out there, watching what was going on. I would not allow much older kids to come in to play with them. I can still remember one day that my aunt and uncle were visiting me…there was a knock at the door and this woman started tearing into me because I wouldn’t let her thirteen year old son in the yard to play with my four, five, and six year old boys..I finally got through to her that I had company and would talk to her later. That brings up another memory….The boys and I had been for a walk and were heading down the lane a little ways from home. I spotted a bank bag… one they cary money in, so I picked it up and took it home…and called the police. I had to show them where I found it ( we thought it had been thrown out of a car as the robbers fled the scene. You guessed it…. it was behind their house! She accused me of telling the police that they robbed the bank! We never did become close friends! If you have read my blog posts before, you will know that I wander..! I’m not sure what I started out to write! Our yard was fairly wide, and was fenced all along the lane.. It was a hot summer, so my husband took some plywood that we had…and a large sheet of plastic. 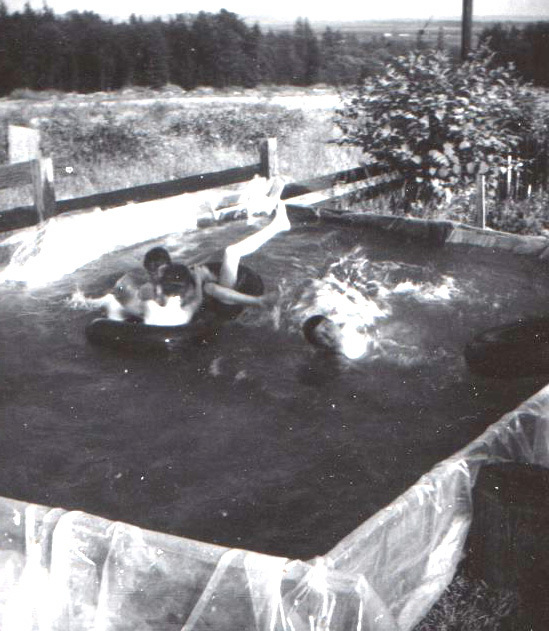 He set up the plywood and draped the plastic over…so that we could now have a pool! It took all night with our hose and our neighbours hose to fill it! It was shallower at one end, and not too deep at the other. My husband would come home from work and go in there with the kids before supper! The boys had a wonderful time playing in there. One friend at a time was allowed to come in to join them. After about a month, a fourteen year old girl slashed the plastic from the lane… and was very lucky she didn’t get hurt when all that water took off! End of pool! I love your memory meanderings. Your boys must have been a good handful growing up. I can just hear the playtime noises from the back yard. heheh wonderful wanderings. 🙂 You have to wonder why a 13 year old would want to play with six year olds. What a very creative way to provide a cooling splash pool for the kids! It’s too bad the 14-year-old spoiled everyone’s fun. The other girl’s mother sounds like the kind we used to call “stage mothers” — the ones whose children were precocious and were maneuvered ahead of others into the limelight. Those mothers were protective and pushy. Neither they nor their children were very popular! The 13 year old was a boy! I love how Mickey created a pool out of what was available. It may not of been perfect, but it sounds like it was a lot of fun! !